After a poor 2011 season, Williams bounced back in 2012 by producing a race winning car in the FW34. Despite finishing only eighth in the Constructors’ Championship, this did not replicate their overall performance of last season as too often driver errors or miscalled strategy found them outside of the points. For 2013, the only way is up for the team as they aim to iron out the mistakes and capitalise on having a high point scoring car. 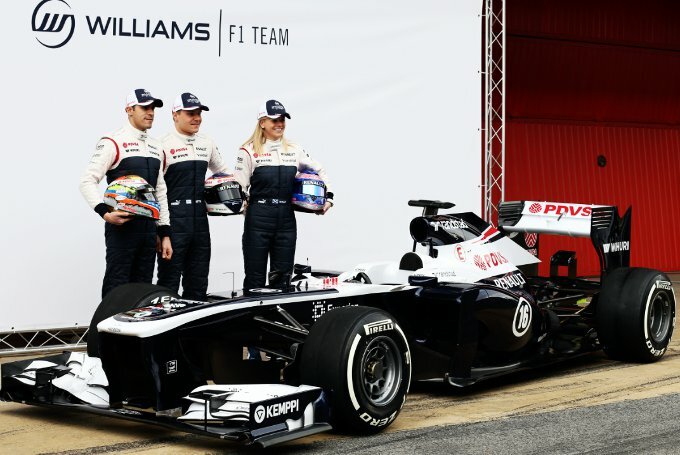 Could the FW35 produce even better results this season? Up front Williams have a slightly new philosophy in order to sort out the aerodynamic problems they were experiencing midway through last season. The complex main plane that formed an ‘m’ shape at its leading edge is gone and a more conventional solution is put in its place. The wing consists of 5 elements with another slot on the lower flap inboard to aid flow around the lower wishbones and underneath the chassis. The main cascade winglets consist of three planes in itself, which slope downward as they meet the endplate which is very similar to the Ferrari’s solution. The main purpose of having an increased number of elements is to produce consistent airflow around the front tyres rather than pure downforce in itself, although having more consistent flow does aid the downforce the wing produces in that respect. On the launch car, the wing featured a very high nose with a modesty panel which included some rather interesting wing pillars. The pillars’ leading edge, much like the Ferrari F138, start right at the front of the nose before sloping back and attaching at the trailing edge of the mainplane of the front wing. However, Williams have tested a number of iterations of their nose/front wing already in Barcelona: they tested the nose they ran in Jerez (see image below) which had the camera pods mounted either side of the tip of the nose; a stepped nose from last season; last season’s front wing AND a new front wing which featured an extension on the cascade winglets (this wing also had removable ‘r’ winglets inboard of the wing). They tested a number of combinations in the opening two days of testing and will probably continue to do so over the rest of the week. Williams were one of the pioneers of the “ductless” brake duct, and the team have continued to develop in this area as it is critical in managing the flow around the front tyre. The launch car showed that Williams have opened up the fairing a little more to allow more airflow to come into the brakes although I would expect to see this change in cooler climates to a narrower inlet as this will give them better aero efficiency and maintain higher brake temperatures. They have retained the strake above the inlet to guide airflow over the top of the upper wishbone and have also added a split turning vane at the lower part of the duct, much like the vanes we see underneath many of the teams’ chassis’. This vane will guide the airflow coming off of the front wing around the front tyre in order to manage the huge wake that it induces at high speed. Williams have also produced another way to manage the wake that the front tyres creates by allowing airflow from the brakes to exit via their wheelnuts. This is not a new idea, Red Bull produced a similar system last year but it was outlawed as the exit holes were along the wheelnut. The Williams solution is legal as the wheelnut is hollow, therefore the exit is actually flush to the surface. The outlets bleed airflow from out of the brake drums to try to reduce the turbulence behind the front tyre, as this hinders aero devices further down the line of the car. The rear brake ducts are an evolution of last year’s concept but I expect to see more detail being added here, particularly where the upper wishbone meets the upright. The sidepods themselves are almost a carry-over from 2012 but they have the addition of the semi-coanda exhausts which are pretty much standard for 2013. However, it is at the exhausts where things are hotting up… if you’ll pardon the pun. I mentioned in my Jerez test review that Caterham had their exhaust layout questioned by other teams, and lately the FIA. Well now Williams have joined the technical brawl by adding a turning vane above the trough that the exhaust lies in. The idea of placing the vane above the trough is to aid the plume from the exhaust to point further downwards to help regain some of the EBD (Exhaust Blown Diffuser) effect from 2011. I am not entirely sure how it works but removing it won’t lose them much laptime, it isn’t something that all the teams will be arguing about as it is not a “silver bullet” in terms of performance. The regulations state that bodywork within an imaginary cone of the exhaust must not manipulate the dynamics of the exhaust plume. Williams argue that, as it is split into two (you can just about see a very small slit between the two pieces of bodywork), it is not a single piece of bodywork and therefore not regarded as a turning vane, which would affect the plume’s path. The FIA have recently stated that it is a piece of bodywork that changes the path of the plume and it is therefore illegal. Williams cannot argue their case until Melbourne, as teams can run whatever they want during the testing period. I won’t go into too much debate here but I would definitely say the Caterham design is illegal. I am yet to make up my mind on the Williams system! The sidepod inlets, barge board and turning vane combination have been carried over from 2012, and we are yet to see any vorticy generators or downwash aids atop of the inlets. The FW35 has also retained its remarkably small gearbox casing to free up additional space at the rear of the car. The rest of the sidepods further back are just a tidied up version of last season’s design, but I heard that Williams will be running their Melbourne-spec sidepods at the final Barcelona test. The FW35 has retained a pushrod front suspension layout, which leaves only McLaren and Ferrari running pullrod for this season, and has also developed its pullrod rear suspension. The driveshaft is nowhere near as aggressively angled as it was in 2011 and although it was refined in 2012, this year’s car is definitely a more traditional layout. Whereas most teams have chosen to either align the driveshaft and trackrod with the lower wishbone assembly or actually house the two inside of it, Williams have preferred to stick with their current platform by keeping the lower wishbone at a lower height and allowing airflow to hit the two devices. They may not have decided to alter the lower wishbone height because they want a well-known setup platform for this year’s new Pirelli tyres, but it would have been a benefit to do so on aerodynamic purpose. As far as I can tell, the rear wing is last year’s version which includes the two slots at the endplate’s leading edge that Marussia have adopted. The monkey seat winglet is different in that they have formed a neat design that is very reminiscent to McLaren’s MP4-23 rear wing from 2008 (shown below). A new version will probably be on its way for the final test. This is the same for the diffuser area, as there are not many noticeable changes in this region but I presume that this is still a baseline test model and that more iterations of the floor and rear wing will be tested across the next couple of weeks ready for Melbourne. This entry was posted in 2013 Launches, Car Launches on February 20, 2013 by thewptformula. The launch of the highly anticipated RB9, Red Bull Racing’s 2013 title contender, took place on Sunday at the squad’s Milton Keynes base in front of the prying eyes of the world’s media. To me I found that the new car was surprisingly undifferent, although there were still a few notable details worth mentioning. Every team’s car (so far) has been an evolution of last season’s, but there have been notable enhancements to the cars for this season from all the teams that have released so far, most obviously the McLaren MP4-28. Jonathon Neale stated that the changes were necessary because it “opens up much greater development potential”, as the regulations have remained very stable for this year. Likewise with the Ferrari F138, there have been fresh ideas and plenty of scope ahead for the Italian team. However, Red Bull Racing have opted to continue with its current platform as it has done so since 2009, choosing to chip away at the finer details – and why not? They had potentially the fastest car in Formula 1 at the end of 2012 (although McLaren ran them very close). But there is defintely some risk to this strategy; Adrian Newey himself announced that development to the car would become increasingly more difficult as the season draws on, perhaps this might be their downfall during the latter stages of the year. I’ll reserve judgement until Melbourne qualifying. The RB9 will most likely look very different come day one of testing this week in Jerez, but there are a few details worth highlighting about the launch version of Adrian Newey’s latest creation. The most obvious change to this year’s RB9 in comparison to the RB8 is the step along the top of the nose, although this is not an actual “step”. It is a slope made up on the same structure as the vanity cover that teams are allowed to run this year to make the cars look more aesthetically pleasing. Running a full vanity cover (as seen on the MP4-28, F138 and VJM06) has a weight penalty of around 100-150g, which Newey thought was not worth putting over the front wing assembly. Instead they have chosen to run a half panel, getting rid of the slot that supposedly cooled the driver and some electronics last year. This allows them to reduce weight over their rivals whilst still gaining some benefit of the smoother chassis top. It was interesting to see that Lotus did not think it was worth having the panel at all, but it would be surprising if they did not test one this week or in Catalunya. I also find it interesting that Red Bull have not exploited the maximum chassis/nose height that the vanity panel allows, suggesting that it isn’t all about how high the nose of the car is when it comes to forcing airflow into the bib area and back to the diffuser. The RB9 also retains last year’s front pushrod suspension and pullrod rear setup. I suspect they thought it was not worth changing the layout of the front suspension because it is a well understood platform and developing the car around the new, higher degredation 2013 Pirelli tyres will be more important than the aero gains of a pullrod layout. Further back, the car has even more tapered sidepods at the intakes, although the launch model retains the sidepod wing assembly and vorticy generators of last year – I expect to see some development in this area over testing. The coanda exhaust system with the under-tunnel to direct airflow into the central section of the car remain, although there have been a few modifications to the exit itself, including the two bubbles that help maintain the flow of exhuast gases down the ramp into the floor section by the rear tyres. I have not seen any clear images of the rear suspension layout, but I am sure further detail has been put into the lower wishbone assembly to assure maximum aero efficiency around the driveshaft and track rod, a key element to last year’s championship winnning RB8 that many teams have adapted to their cars this year. Raising the lower wishbone to either align it with the driveshaft (or actually implement it within the structure i.e. McLaren/RBR) reduces the turbulence that the spinning cylindrical device creates, reducing drag and tidying up the airflow to the diffuser. Red Bull have said that they are open to trying out the passive Drag Reduction Device, pioneered by Lotus and Mercedes, so expect to see some changes to the roll hoop area to accomodate this. With DRS only allowed in certain sections of the track during practise and qualifying this season, I think it would be highly beneficial to them as they are traditionally fairly slow in top speed compared to their main rivals. Expect to see many changes to the car during the Barcelona test and perhaps Jerez this coming week! This entry was posted in 2013 Launches, Car Launches on February 3, 2013 by thewptformula.